The following list is provided to help you diagnose what the problem weed is, and how we can help. What you see listed below, are all the common weeds we have found in Mississauga lawns and gardens. Quite often, weeds indicate deficiencies in soil. An organic weed removal program should always include the necessary soil amendments and prompt over-seeding with a suitable grass seed for your specific lawn type. Our Mississauga lawn care services are specifically designed to assist you with weed infestations. Kick Gas offers organic and emission free services. 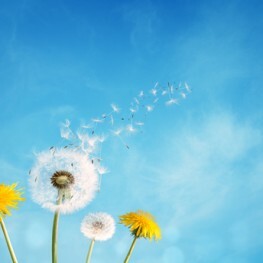 The Dandelion is by far the most recognized weed we see while providing Mississauga grass cutting services. Lawn care lovers battle this weed annually. Long serrated leaves, bright yellow globe flower and deep taproot. Low calcium, pH, high potassium. Manual removal (being sure to get the entire root). Add calcium and lime. Over seed to thicken lawn. We can help. 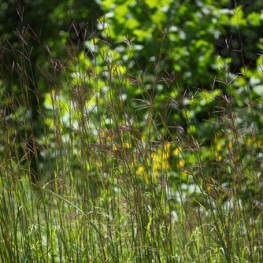 Black Medic is another common weed in Mississauga lawns. 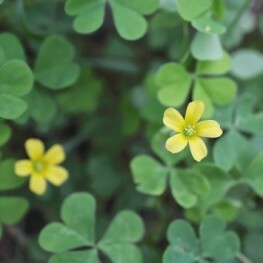 Often confused with clover, because of the similar leaves. When left to its own devices, black medic can overrun a lawn, but it’s surprisingly easy to remove. Mat forming. Clover like leaves. Small yellow flowers in early summer. Low nitrogen. High magnesium, sulphur or iron. Pull by hand. Add nitrogen or compost and overseed. Let us do the work! And it does just that. It creeps and creeps, then creeps some more. This broad leaf weed can do some serious damage if left unchecked. Catching this weed early is critical. It’s best to contact a Mississauga lawn care provider to assist in removal of this aggressive weed. Low growing and very aggressive. Leaves are very similar to that of a geranium. Tiny purple flowers and minty scented leaves. Low nitrogen. High calcium, iron or sulphur. Poor drainage. Remove by hand. Add nitrogen or compost. Dethatch the lawn and overseed. 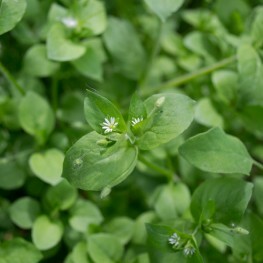 Chickweed is edible and used as an herb, but it’s also a lawn weed for some. If you have a problem with chickweed in your lawn or interlocking, our chemical free services can help. Mat forming. 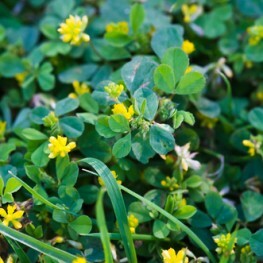 Yellowish green leaves (grow in pairs side by side) on thin stems with small white flowers in spring time. Low calcium, phosphorus. High nitrogen, potassium or magnesium. Pull by hand and overseed in early fall while the weather is still warm. Chickweed is an annual, so it is important to remove before it goes to seed. Often confused with crabgrass, this is a very difficult weed to control, if left unchecked for too long. Quackgrass is hearty and can soak up valuable nutrients from your soil, affecting the health of desirable grass species. It can carry leaf rust, attract armyworms and cereal leaf beetle. Mississauga lawn care companies should provide inspections while cutting your grass. Early detection is the key controlling this potential problem. If you’re looking for the best lawn care company in Mississauga, take a look at our services and see what we ca do for you. Clump-forming grass with blue-green blades. Can grow up to 36 inches. Low calcium, humus; high sulphur, potassium or phosphorus. Add calcium, compost; pull main plant and shoots, aerate and overseed. This plant is grown in some countries as a food source and is very nutritious. It is often seen in garden beds and in the spaces between pavers and patio stones. 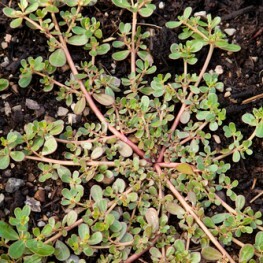 Purslane can produce seeds even after being removed from the ground, it should promptly be bagged. Knowing how to keep your lawn healthy can avoid potential problems. Kick Gas Lawn Care offers lawn care tips on our frequently asked questions page. 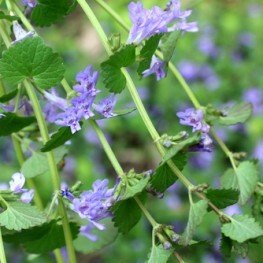 Low growing with plump, purplish stems and shiny oblong leaves. Produces five-petaled yellow flowers in the summer. Low nitrogen, calcium, phosphorus, moisture, humus: high potassium or sodium. Add compost, nitrogen, calcium: frequent watering. Easily pulled by hand from garden beds, but difficult between pavers when soil is dry. Water area to be weeded first. If your grass looks like the picture, you have a violet problem. 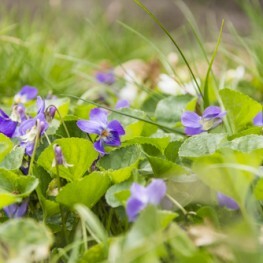 Very pretty, if controlled in the garden, but violets in your lawn can be a challenge to eradicate. Lawn maintenance in Mississauga should follow the Kick Gas principles. No chemicals. No noise pollution. No emissions. We can help. Green heart shaped leaves; purple, pink or white flowers. The roots look similar to ginger but much smaller. Add lime, calcium: remove plant and root. Overseed to thicken grass. 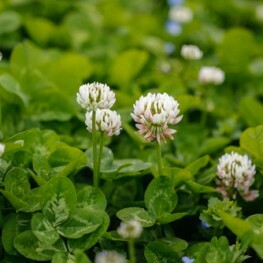 For me, the issue of white clover being a weed is very controversial. White clover used to be a standard in all seed mixes before broad leaf herbicides were produced. It fixes nitrogen from the atmosphere, is drought resistant and stays green until the snow hits. What more can you ask for? The only downfall of white clover, in lawns, is the height and the amount of flowers produced. Kick Gas Lawn Care seeds micro clover lawns. Micro clover produces very few flowers and grows to approximately 4 inches. Low growing with dark green leaves of three with white and pink flowers. Pull by hand; add nitrogen or compost and lime. Here is another weed that is edible and has very powerful medicinal properties. 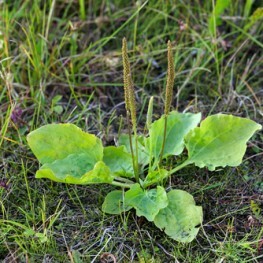 In spite of its uses, the plantain is not desirable in gardens or lawns. From our observations while providing lawn care in Mississauga, plantain is more common in interlocking and lawns than in gardens. Large, oval, ribbed leaves with flowering stalks shooting up in the centre of the plant. High calcium, phosphorus, potassium: acidic soil with poor drainage. Add compost, aerate and amend with lime. Thicken grass by overseeding. As a Mississauga grass cutting service; we see all kinds of lawn weeds. 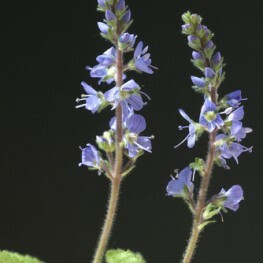 Occasionally, we see lawns that have let speedwell go to seed and flourish in their lawn. Matting perennial. Green stems with small hairs. Vertical shoots with small purple flowers from May-August. Add compost and calcium. Pull by hand before seeding. This weed has many culinary and medicinal properties. This is a very common weed in Mississauga gardens and lawns. Three lobed heart shaped leaves that are similar to clover. It has small yellow flowers that bloom all summer. Low nitrogen, phosphorus, calcium, humus: high potassium. Add compost and calcium. Easily removed by hand and best done before seeds form. Seed pods explode and can launch seeds over 10 feet. Easily confused with deadnettle. 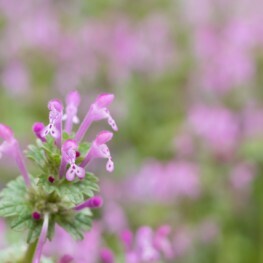 Henbit is a member of the mint family. This weed is very common in Mississauga gardens. It grows to height of 10 cm to 30 cm. Henbit has slightly hairy, square stems with leaves in opposite pairs. The tubular flowers resemble an orchid, with a white face and dark red spots. Low calcium, humus; high moisture. Add calcium and compost. Pull by hand and overseed.